* You want to get away from the noise of the city. * Traffic is getting nuts and you want to avoid cars. * You'd rather hit the protective terrain and vegetation of trails for a mountain bike ride instead of the asphalt. * The steep hills in mountain biking can help you build power for the road. 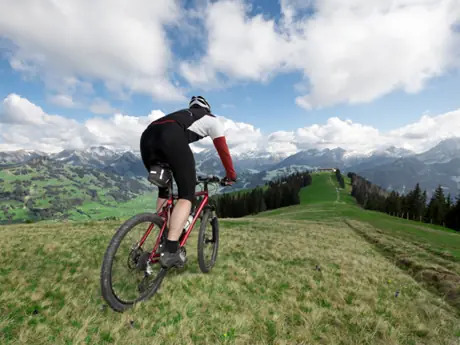 * Mountain biking seems more laid back and you could do with less stress in your life. Whatever your reason might be, getting started seems easy enough—you've already got great cycling fitness, so how hard can it be? More often than not, the switch isn't so straightforward. Most roadies are surprised that when they hit the dirt, many things change—and mountain biking suddenly becomes a lot more intimidating. Your confidence and comfort on the terrain will improve by spending just a few days building up basic skills on the mountain bike. To help you get a jump-start on your new mountain biking adventures, here are a few drills and tips for climbing and descending. * Keep your arms bent and relaxed. * Bring your shoulders forward toward the handlebars. * Move your hips forward on the saddle. This change in position will keep your tires in contact with the ground so that most of your power is applied to the pedals and transferred into forward motion. Drill: See how far forward you can move before your rear wheel begins to slip and waste energy. As the gradient of the trail gets steeper, you'll have to move more forward on the bike in order to maintain your balance. Your head and shoulders will get lower, and your hips should only touch the tip of the saddle. Drill: On a moderately steep climb, move back on the bike until you can feel the front tire slightly lift up off of the trail. When you ride on a hard-packed dirt surface, your position on the bike isn't as critical as it is when the trail is loose. Because of this, you'll need to fine-tune your position.